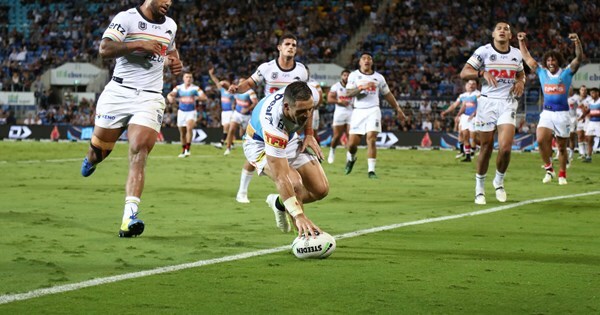 Michael Gordon's 250th NRL match ended in joy, with the Gold Coast Titans scoring a 30-24 win over the Penrith Panthers on Friday night. this is a game with more interest than it should have considering pre season Panthers were title contenders and Titans would have been bottom 4 but here it is Round 5 and Panthers are 2 from 4 and Titans 0 from 4. To say here are 2 teams struggling for from would be an understatement and despite hitting the panic button both coaches have stood by their sides albeit with 1 single change for us of DWZ to FB and Edwards to wing. For these reasons a lot hangs on this game. Sadly for Garth Brennan, I don’t think even winning this game will help his future of the Titans, as I have a feeling that a decision had been made weeks ago, and these weeks following are a mere formality as they find another coach. On to the game, I found it interesting they have selected the only active NRL referee with the highest success rate for Penrith… could this have something about some dud calls last week? (Like the Kikau try and the Edwards knock-on)… Maybe I am reading too much into that. Looking at the team, Ivan seems to think that the team must be on the improve, as for except for a positional changes and a replacement for Winterstein the side is the same is virtually the same, I was a bit disappointed about TIm Grant not getting a starting spot, he has been crushing it in the lower grades. Also am I the only on thinking that the halves should be switch back to the other side of the field (ala 2018)? I am also happy with the DWZ/Edwards switch. I love Edwards speed, but I like how DWZ returns the ball after a kick, I feel that Edwards will grow into a wingers spot an feel that he will be the better for it in the long run. I didn’t like the call for some fans to drop him, it is clear as day the kid has talent, he just hit a slump, the players and coach were supporting him and saying he should be in the squad. I would like to see how many of those “Facebook Coaches” have not hit a career slump before, and I bet they gave them more than a week to “right the ship” so to speak. A win is vital here, despite a terrible start to the season, to be 3/5 going into round 6 really places the team in a good position (assuming their form improves). I feel that one good comprehensive win can go a long way to kickstarting the Panthers season. I hope this is that win.